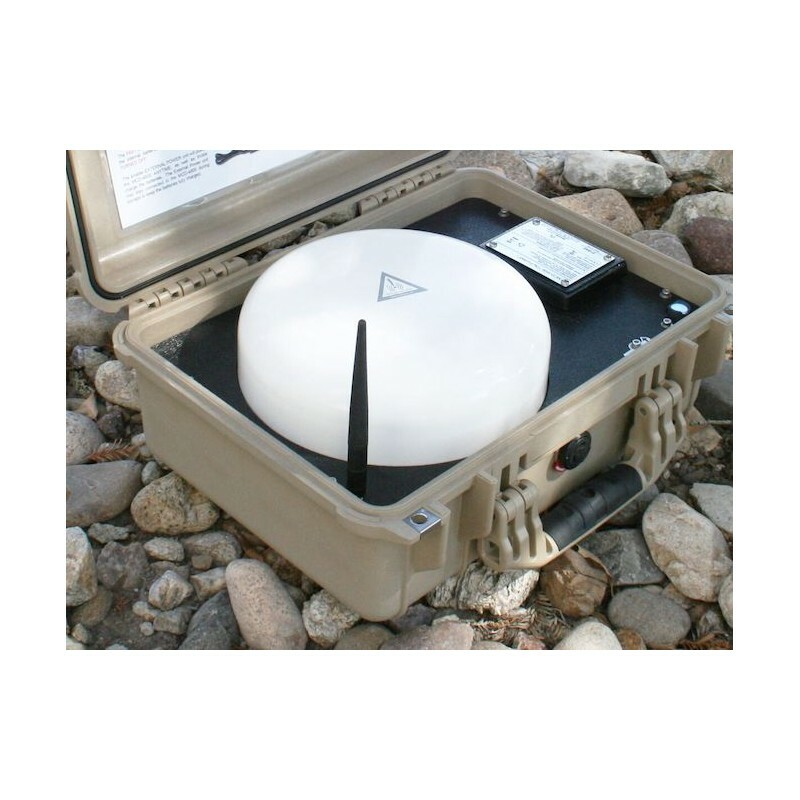 The MCD-4800 is an auto-pointing BGAN satellite terminal and is easily operated by anyone requiring no training or certification to use. Wi-Fi Hotspot for all in-range devices up to 100 meters (328 feet!). Broadband speeds of 464 Kbps (94.5% as fast as the fastest BGAN). May be operated by anyone. Online in about 1 minute. 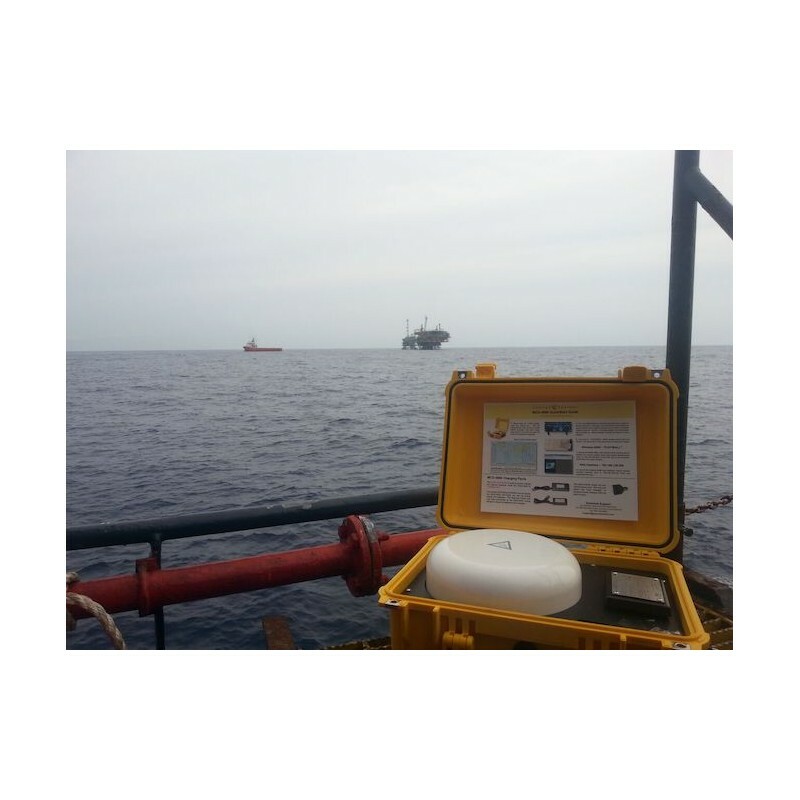 Operates stationary or in-motion, on land or open ocean. Weighs 25 lbs and will run for up to 5 hours on internal battery. Internet, Phone, SMS Messaging, Voicemail - A Mobile Office. 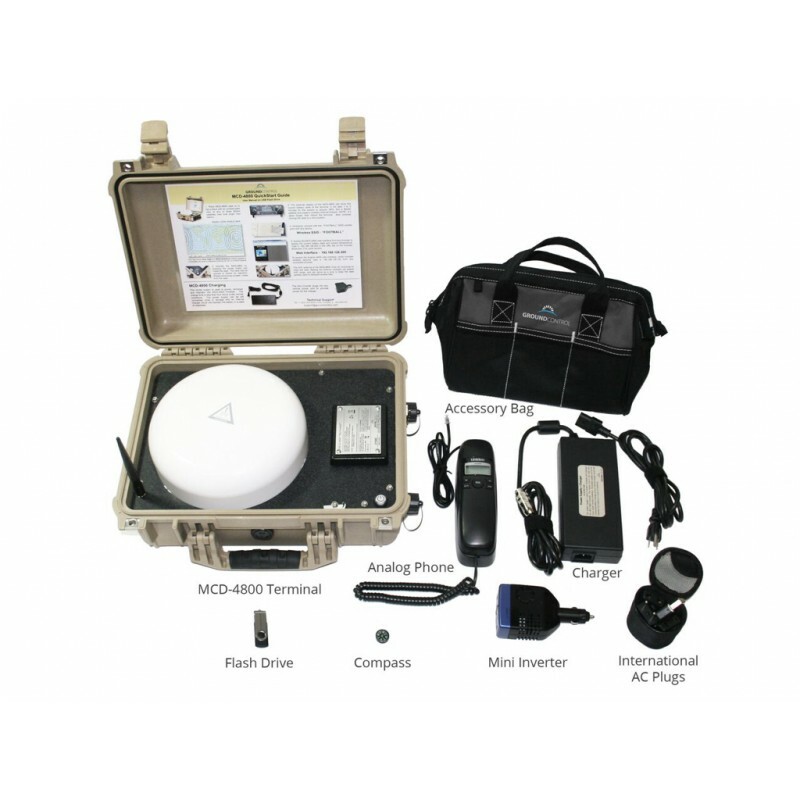 The MCD-4800 "Mobile Communications Device", also known as "The Football", is an auto-pointing BGAN satellite terminal that requires no user training to operate. Simply place the weather-tight case on the ground, or on a boat deck, or on any surface with a clear view of the sky, rain or shine, anywhere in the world and turn it on - no pointing necessary. Within a minute the MCD-4800 becomes a powerful WiFi hotspot accessible by any wireless device within a 100 meter range for up to 5 hours on internal battery power. 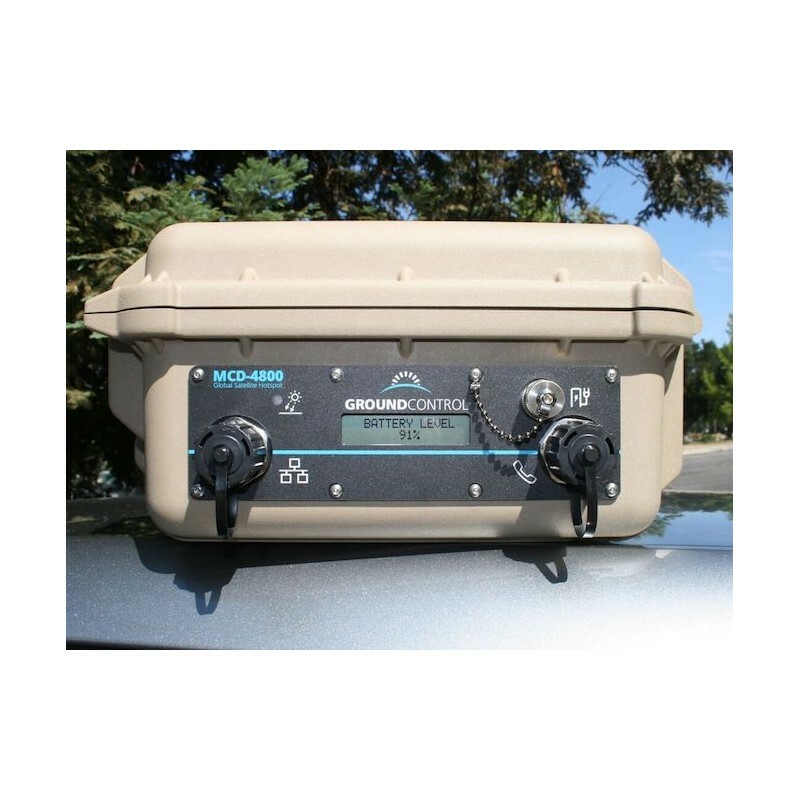 This auto-pointing solution uses the high performance Hughes 9450 in-motion BGAN terminal integrated with our proprietary mobile electronics for a ruggedized self-contained, in-field, user-friendly global communications link. While the MCD-4800 is primaily used as a wireless hotspot, the front panel includes a weather sealed Ethernet port and a phone port for a standard phone. 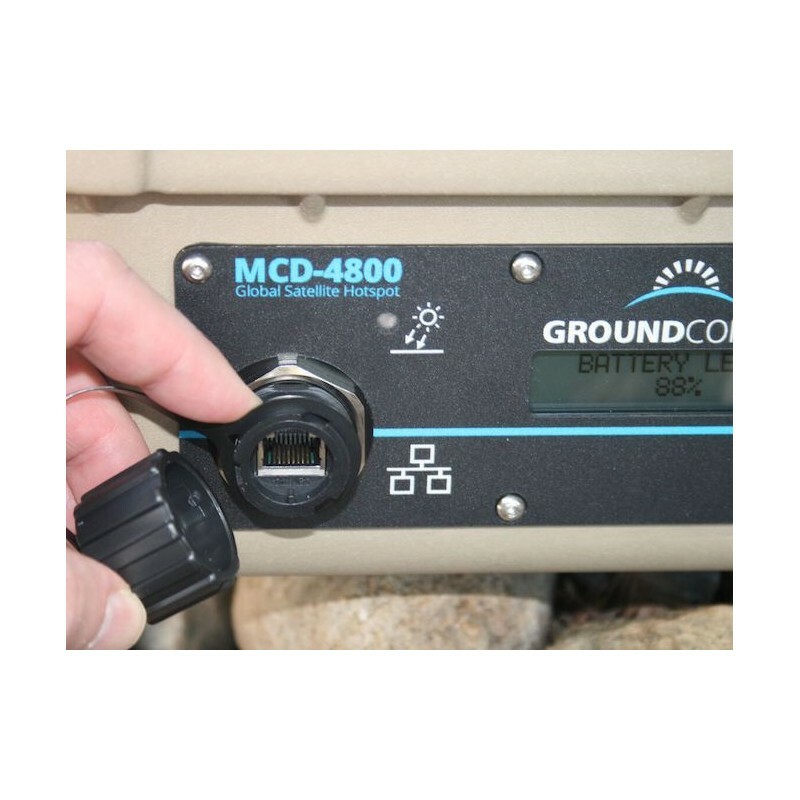 The charge port has a watertight seal for several external power sources such as a portable solar panel, external battery, or vehicle power adapter. The display shows current system status and remaining battery power and a light sensor allows the display to be backlit at night (backlight may be enabled/disabled). The MCD-4800 only has one button, the power button located inside of the case. 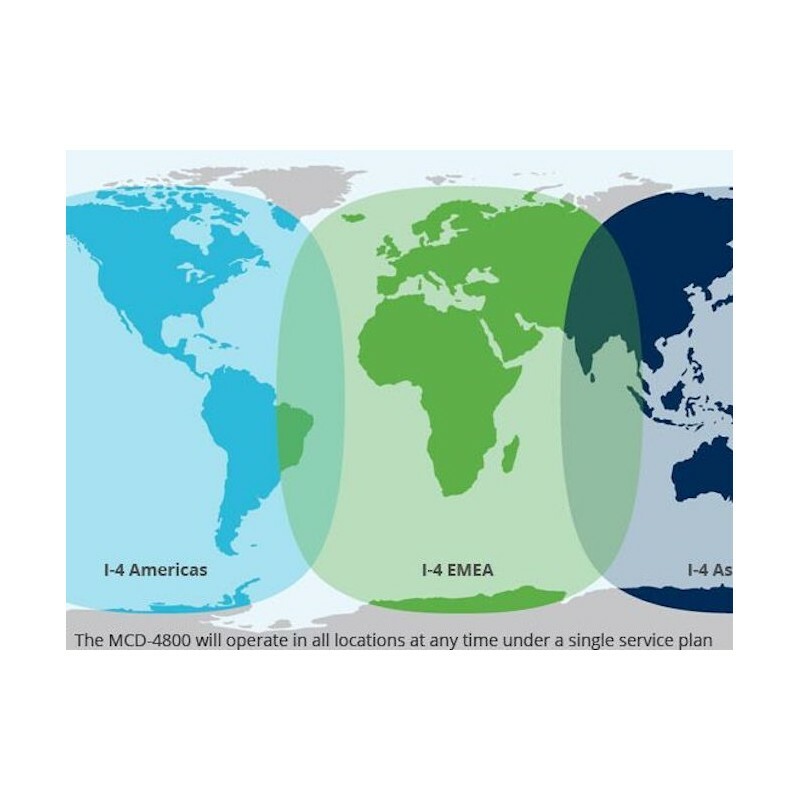 The service area of the MCD-4800 is global except for extreme polar regions. If the system is located within any of the coloured regions above, you may connect at broadband speeds. 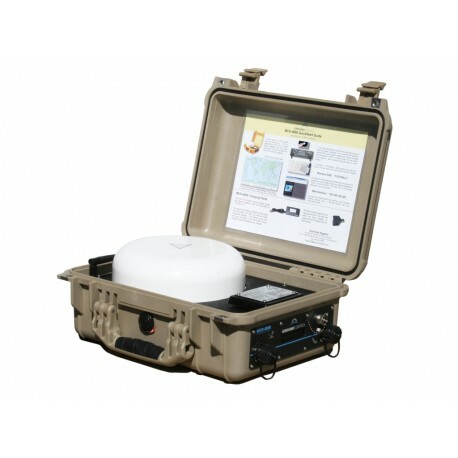 The MCD-4800 uses BGAN service plans available from Ground Control or other BGAN service provider for Internet, phone, SMS messaging and many other communication services. 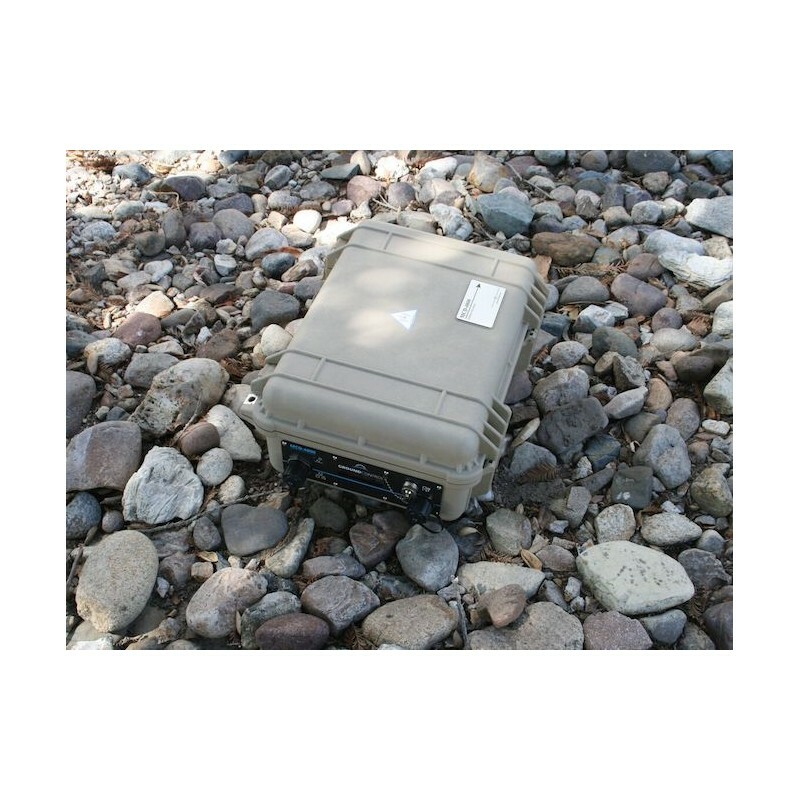 The MCD-4800 is enclosed in a watertight hardened plastic Pelican case, and the case lid does not need to be opened in order for it to fully function. It operates in heavy rain and will transmit with 20mm of ice buildup before transmission issues. 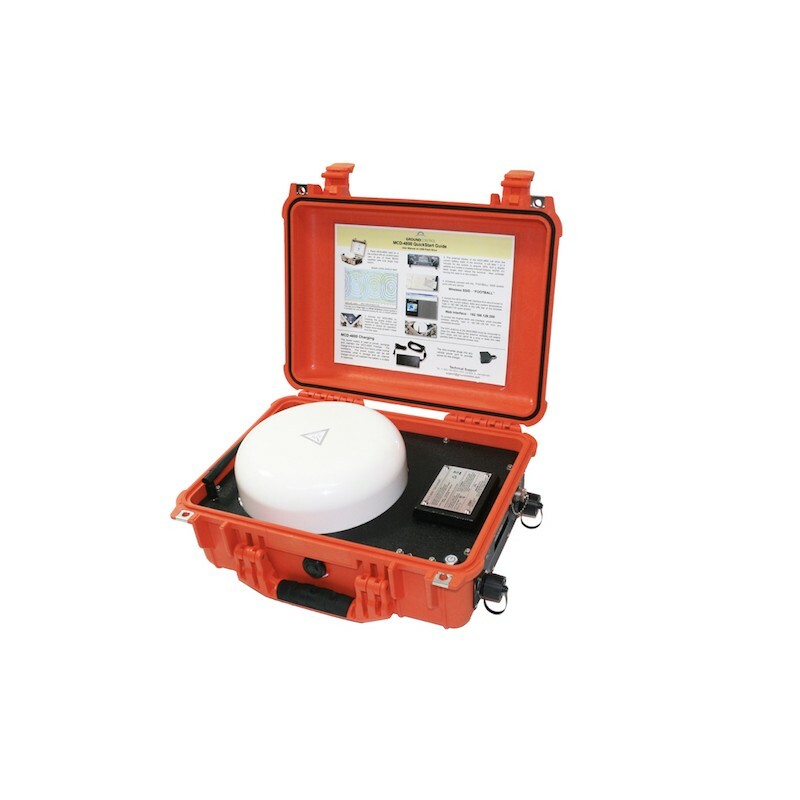 It is rated at IP67, which means it can withstand immersion in water up to 1 meter. 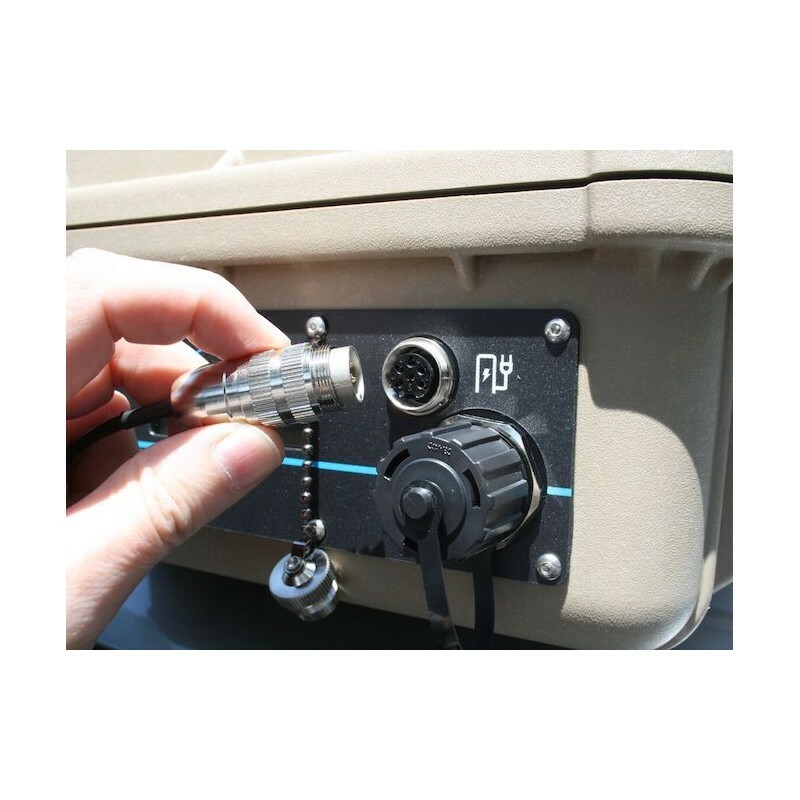 In extremely hot environments, we recommend the case lid be slightly opened for venting for long duration use to avoid heat buildup inside the case. No pointing or aiming...simply turn it on under an open sky on land or at sea. Connects automatically with any BGAN satellites for near 100% global service. Does not require user interaction. No software to run. Establishes AP "Hotspot" automatically. Ruggedized. Operates in extreme conditions. Case does not need to be opened for operation. 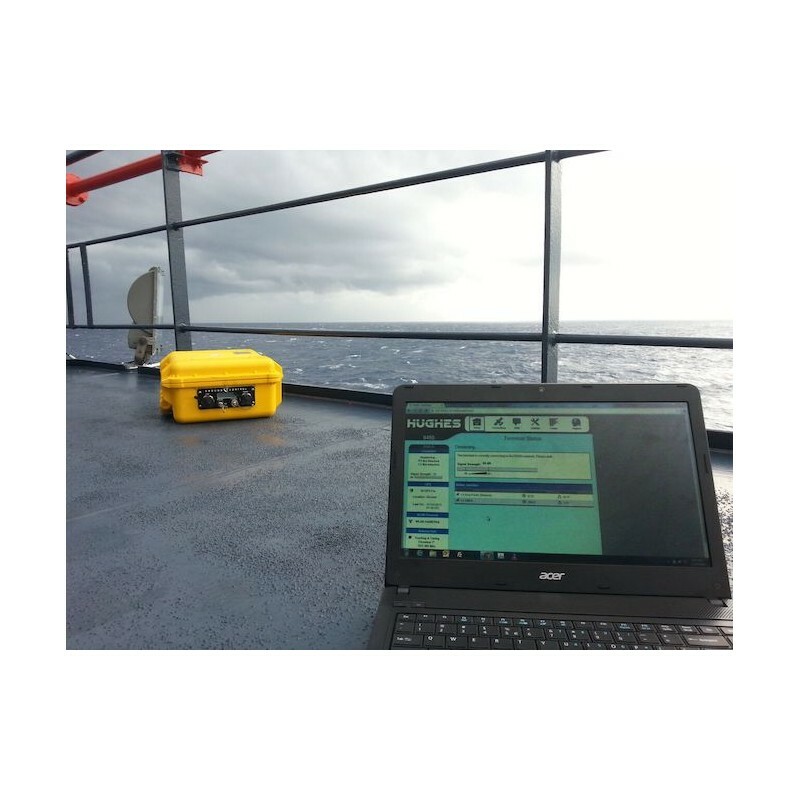 Operates stationary or in-motion such as on top of a vehicle, or a vessel on the ocean. WiFi Range up to 100 meters (328 feet) for laptops, smartphones...any wireless capable device. Compact size 17" x 13.75" x 6.75" (432 x 349 x 171 mm) and weighs 25 lbs (10.9 kg). External all weather Ethernet (RJ-45) and phone (RJ-11) connection ports. Up to 5 hour battery life (rechargeable) for normal use. May be plugged into a vehicle 12V power port for continuous operation or charging. Operates from -25° C to +70° C (-13° F to 158° F) operating temperatures. Includes standard analog phone. The RJ-11 jack is assigned an international phone number. SMS messages are $0.50 cents w/free incoming messages. iPhone texting capable. No rain fade - Operates in heavy rain and will function with up to 20mm of ice buildup. Internal temperature control fan - cools internal electronics during high temperatures. 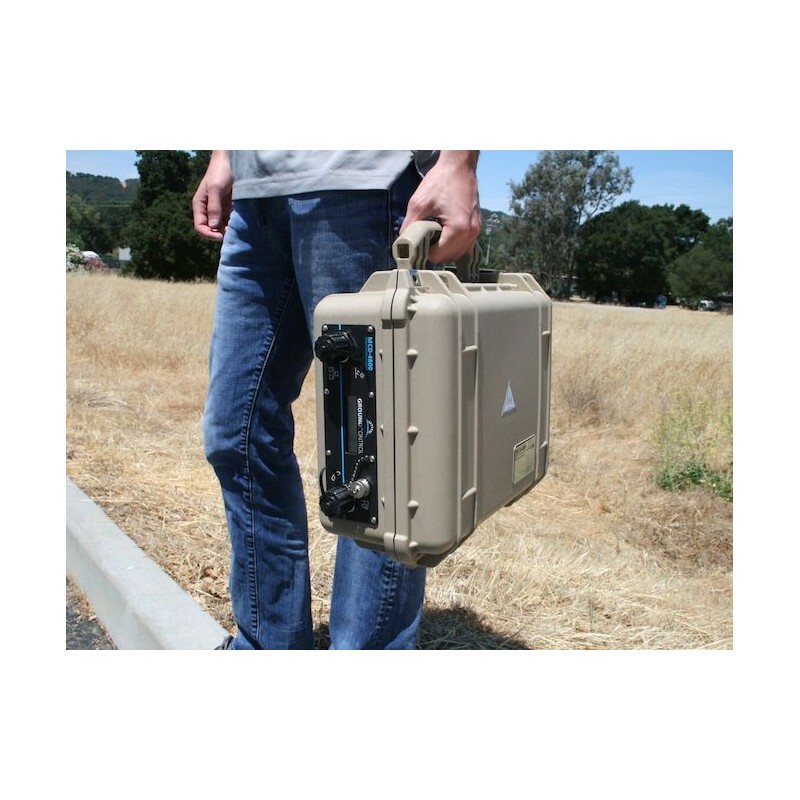 Portable - Ships UPS, FedEx, flight carry-on luggage anywhere (no special battery regulations). Full IP compatibility - Internet, SMTP email, file transfer (FTP, and VPN) standard TCP-IP. Global public / static IP addresses are available from Ground Control. Powerful firewall rules available at no additional cost with Ground Control BGAN service. Optional 62 watt foldable solar panel available, increases runtime, or recharge. Custom engineering available... such as adding special equipment inside a larger case. 1 year standard warranty. 3 year and 5 year warranties available. 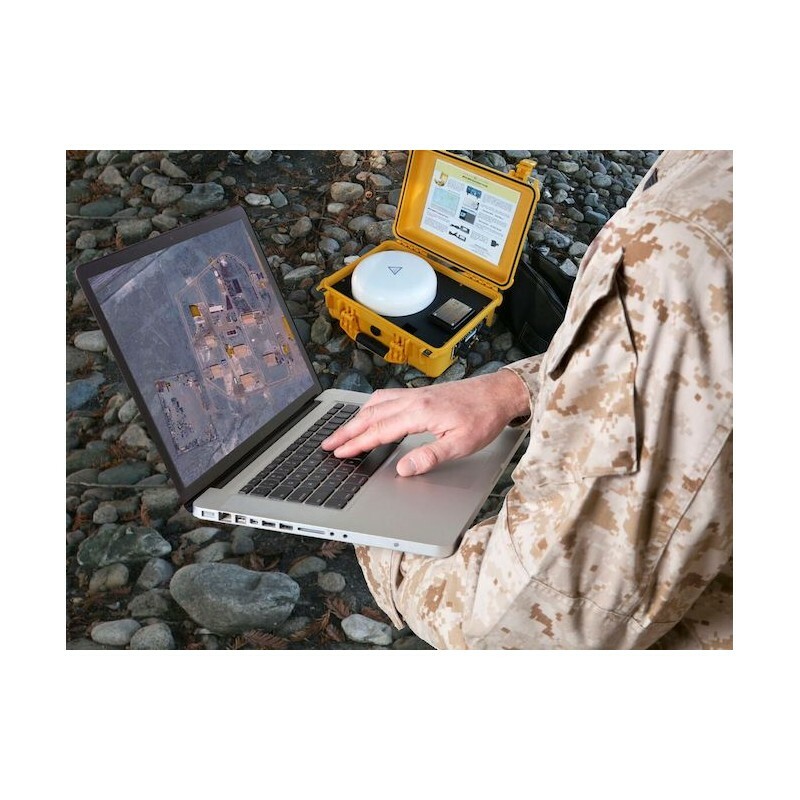 The MCD-4800 is a Ground Control integrated manufactured solution, supported by us 24/7. Internal power button - Lighted on/off button (replaces external keyed power switch). WiFi antenna now accessible - Optional high-gain antenna for increased WiFi range. > One power supply replaces the two chargers used in Gen 1 model. > Fast charge time of 4 hours on a discharged battery. > Built-in automatic maintenance mode for long term storage charging. Backlit display for night use. Shows power remaining. Can be enabled/disabled. High contrast daylight display for easy reading in any light. Easy BGAN SIM card insertion & removal. Requires no tools.